Following on from my recent report on Brisbane to Sydney here is a quick rundown of the next leg, an Sydney to Hobart. This flight would be on a Boeing 737-800 aircraft. There is only one Qantas service per day on this route, it operates in the early afternoon. All other services by the Qantas group on Sydney to Hobart are operated by low cost carrier, Jetstar. This short review will mostly be in pictures. Let's start in the domestic business class lounge at Qantas' main hub, Sydney. That's enough of the lounge, now it's onto the aircraft for this 1 hour 45 minute flight to Hobart. We pushed back on schedule and today's flight was full with 12 out of 12 seats occupied. 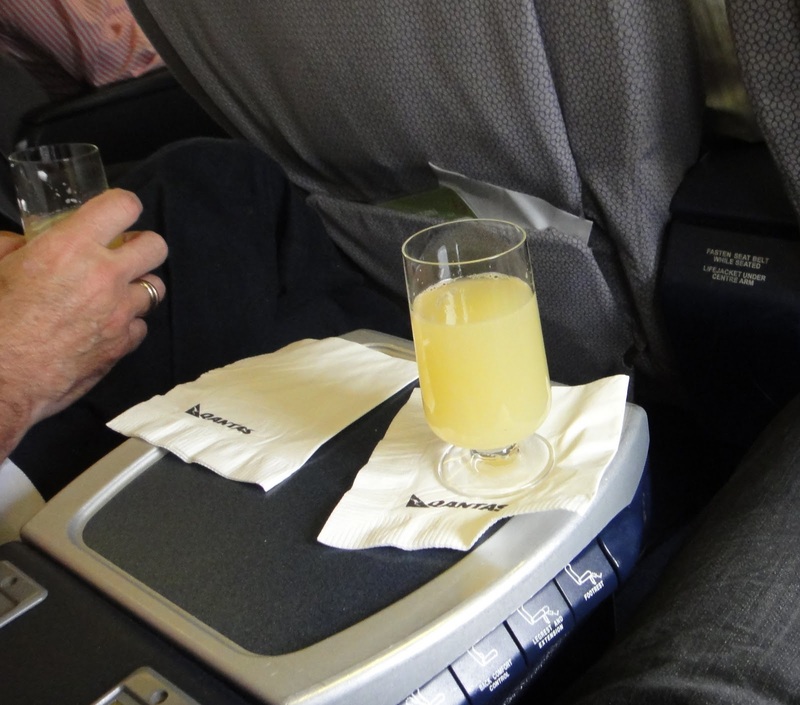 We were offered the standard apple juice welcome drink, suitable for a flight to the 'Apple Isle'. The taxi to runway 16R is very short so we are soon underway. There is no PTV's on this aircraft in any class. Drop down LCD screens were used to show some light entertainment programs. We were served a light meal, there was no choice. One option only and it was cold beef with cous cous and some kind of orange and chocolate cake for dessert. I had a glass of wine with my meal. Hobart airport is pretty basic and there is no air bridges. We disembarked into the cool late afternoon air. It's about 12 degrees celsius outside. I can't believe that's business class! The chairs always look so big when I board a domestic flight. You're probably better off flying economy and choosing the emergency row seats.